Happy Friday and welcome to your weekly French beauty post! 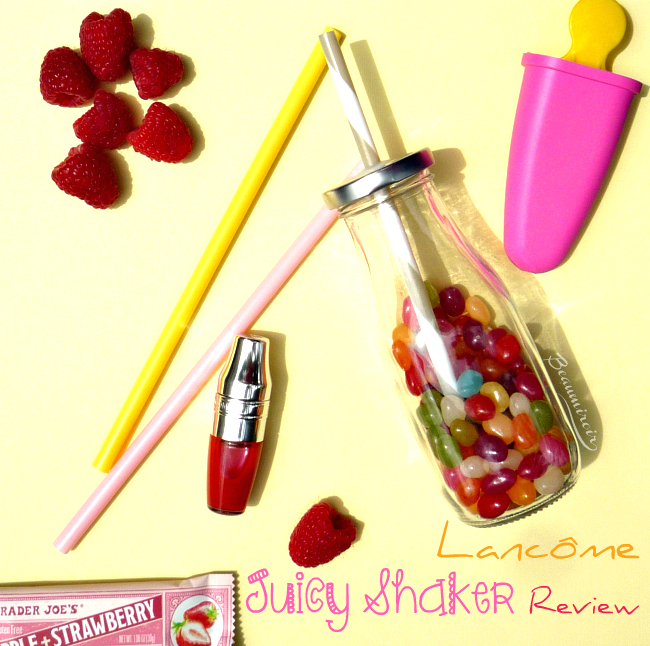 This week is going to be fun and juicy with my review of the new creation for lips by Lancôme, the Juicy Shaker. 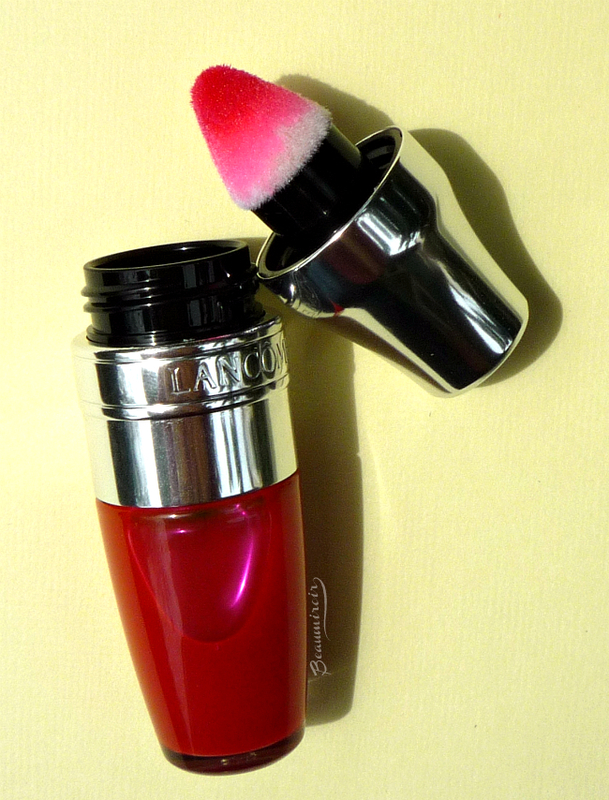 If you're a #FrenchFriday regular, you know that Lancôme is my favorite French makeup brand, the one I've talked about the most in the past year. As you can imagine I got very excited when I first saw pictures of the Juicy Shaker being released in Europe, and waiting for its late launch in the USA tested my patience. Can we please get a simultaneous worldwide launch for your big new releases in the future, dear Lancôme, rather than suffering through several months of delay while your official Instagram account is full of pictures of the new sensation (we're still waiting for Guerlain's La Petite Robe Noire makeup collection here by the way...)? Anyways, the Juicy Shaker finally became available on Lancôme's website in the last days of March, first exclusively for their rewards members, and I grabbed one as fast as I could! I wanted to try all 20 shades, but for now I just picked 341 Bohemian Raspberry. 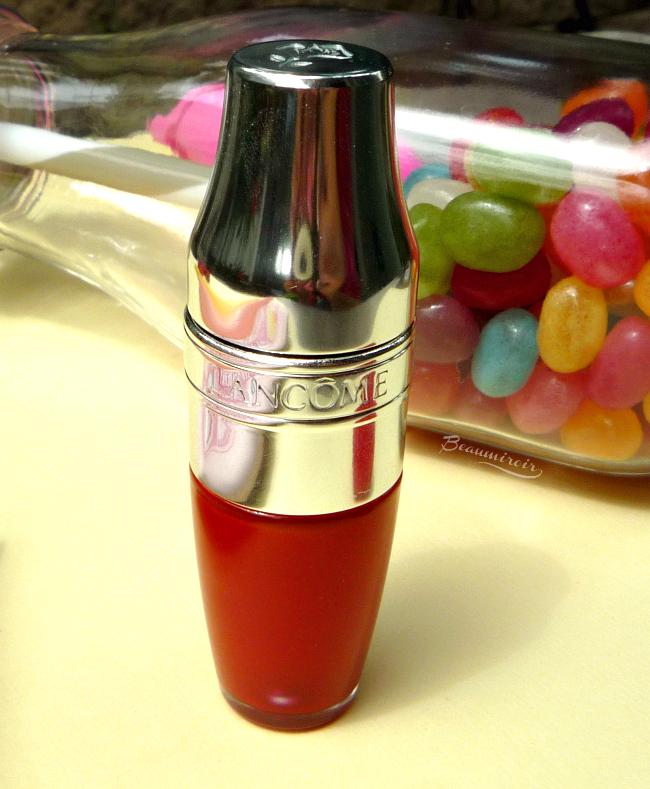 It's a cute and fun little object, and as you can see from my pictures full of jelly beans, fruits and bright colors, I was soon infected by the optimism of the #bantheboring campaign that Lancôme is orchestrating around this new launch. 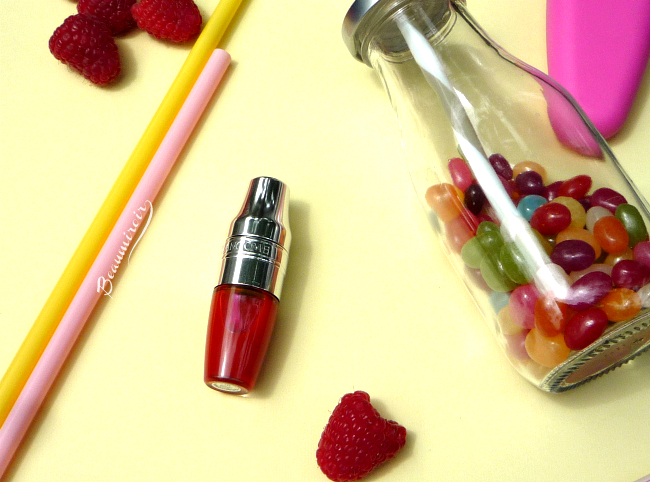 It may look like a grown up girl's toy, but the Shaker is also a sturdy, well designed little thing that I can throw in my purse for touch-ups without worrying about leaks, and it makes the use of the lip oil it contains completely mess-free. You heard in the video that the Juicy Shaker being a bi-phase oil, it needs shaking, and there's actually the same kind of metal ball in the tube than what you get in nail lacquers, only bigger. But in my experience with Bohemian Raspberry, the two phases don't separate quickly at all, and I've never seen a huge portion of clear oil with dense pigment packed at the bottom in my Shaker, even after not touching it for a couple days. So don't worry about having to shake it every 5 seconds, the phases won't separate while you're still putting it on. Talking about that, the little applicator in there is both unique and delightful to use! It's velvety, super cushy and bouncy, incredibly soft on the lips, and the shape allows surprisingly precise application on the lip edges for such a slippery formula. Everywhere I look I see that you're supposed to tap it onto the lips, but swiping like I do with a regular doe-foot applicator works perfectly fine for me. It may look like there's little color concentrated on the tip of the applicator when you pull it out, but there's in fact more than you think and way enough oil to cover the entire lips without having to dip it in the tube again. The Juicy Shaker is meant to be sheer but Bohemian Raspberry imparts a nice pop of color. It's a cool and bright medium pink once applied, although it looks like a deep red in the Shaker. This is an indication that the color you see in the tube is very different from what it looks like on the lips due to the transparency of the formula, so you should either swatch the shades for yourself or search for swatches online if you want a good idea of the final result. 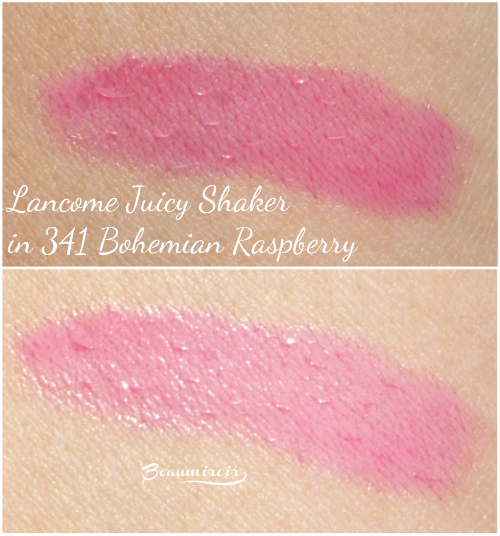 The color of Bohemian Raspberry reminds me a lot of my Shine Lover lipstick in French Sourire, also by Lancôme, and although I haven't tried yet I think they would work well layered! It's a very pretty, happy color that brightens the face and I can see myself using it a lot in the summer. 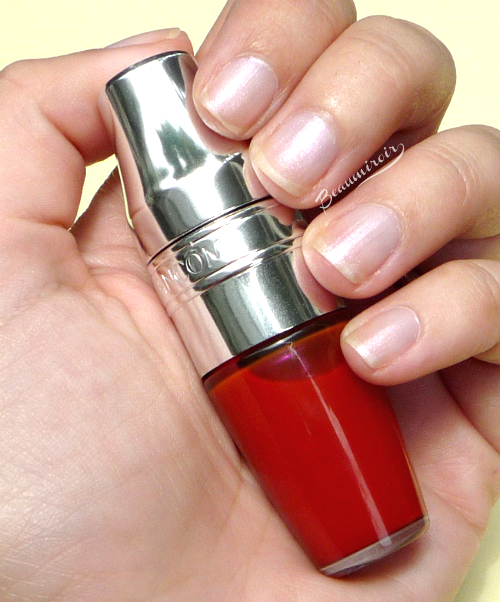 The formula is very, very light and so weightless that I can't feel it on my lips when I'm wearing it. It's also very comfortable and lightly hydrating: you can't expect it to repair severely chapped lips, but it does add a bit of moisture. Being an oil it does feel slippery, but not oily in a gross way as if you had smeared salad dressing on your lips. It has a very thin and fluid texture, and it actually contains 5 plant oils to nourish and treat the lips: apricot kernel, "rose de muscat" (this is simply rosehip), cranberry, peach kernel and sweet almond oils. It also contains silicones. Every shade is supposed to have a different scent and flavor. I cannot confirmed that, having only tested one for now, but Bohemian Raspberry does have a sweet, fruity scent with a hint of raspberry tartness. It's very present but not excessively strong, unlike the overwhelming synthetic mango scent of the YSL Gloss Volupté for example, so I quite enjoyed it. I personally don't eat my gloss... but I did lick for the sake of this review, and it simply tasted sweet to me, without any particular fruit flavor. 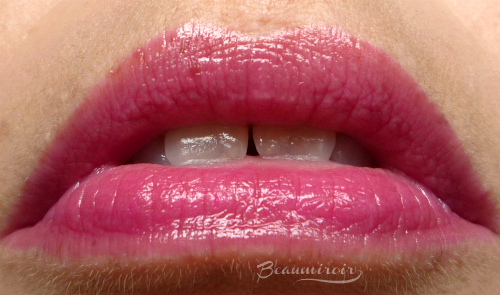 The finish on the lips is nicely glossy, although not over-the-top mirror-like shiny. It basically looks like a sheer gloss, except much thinner and without the stickiness or tackiness. The shine itself wears away within 2 hours, however it leaves behind a very noticeable color stain that lasts much longer. That was a bit unexpected for me and it was a pleasant surprise to see such a light, comfortable product leaving a stain, very similar in that regard to the Shine Lover. The cool thing is that if you reapply the Juicy Shaker on top of that stain to get the finish glossy again, the color will build up. Last time I used Bohemian Raspberry I reapplied it 3 or 4 times throughout the afternoon, and when I finally went to dinner the color on my lips was pretty intense. So much so that I still had a visible stain left after dinner, which consisted of one of the biggest lipstick killers you could eat: pulled pork tacos! Yet another fantastic lippie launch by Lancôme! After great mattes last fall, this time the brand has perfectly captured the fun and lightness of summer with their Juicy Shaker. 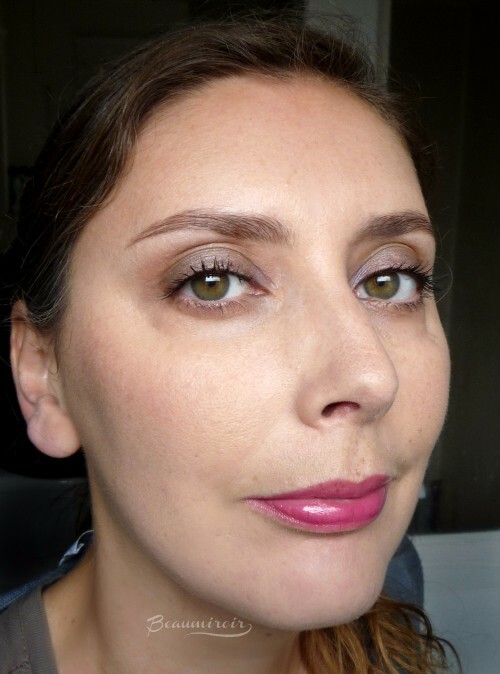 It's cute, easy to use, and adds a nice pop of color to the lips. Not just a gimmicky crowd-pleasing product, it actually features a great weightless oil formula that leaves a nice stain as it wears away. I absolutely love it and I'm already thinking about the colors I want next! Have you ever tried lip oils? What do you think of this trend? Do you intend to get a Juicy Shaker?